I love sun-kissed bronzy makeup, it's one of my favourite things about summer. I actually done a similar post 2 years ago here. 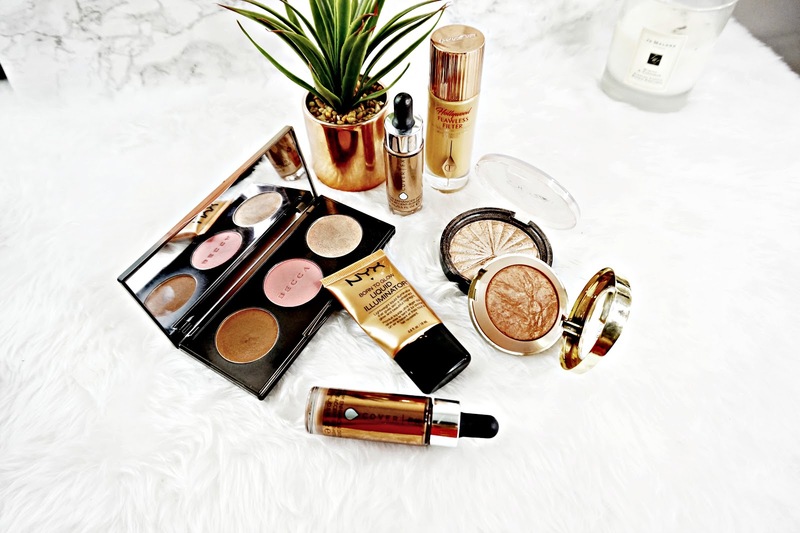 But I thought Id give it a revamp and share my current sun kissed favourites. To start the whole glow-y makeup look I love to go in with a dewy primer. This offering from Charlotte Tilbury gives my skin such a good glow without looking oily or sweaty. This also contains light reflecting particles that help to blur pores and fine lines. It can be used alone, as a primer or as a subtle highlighter over makeup. It's a fab little multi tasker and great summer product. I actually featured this in my post 2 years ago and I still love it. It's actually very similar to the Charlotte Tilbury primer in the way it looks when foundation is applied over the top. It gives the skin a lovely bronzed, glowing look. Although I wouldn't wear this alone because it does have more of a shimmery finish than the CT one. I love how this smooths all my skin out and makeup glides over the top. Liquid bronzer does sound super scary but this is so easy to use! I only use two tiny drops on a buffing brush and this gives the face a gorgeous sun kissed look. I'll use it on my cheeks and around the outer part of my forehead. I have the shade Sunset which is a very natural Bronze colour on my skin. These are so long lasting to. I don't find I need to set them down but if you're oily you may want to. Nothing gives the skin a gorgeous sheen like liquid highlighters. I've been loving these ones from CoverFX in the shade Moonlight. The shade itself is a Champagne colour that has a slight golden undertone. It looks stunning against a bronzey makeup look. I like to apply these to the high points of my face and blend with a Beauty Blender. These do give a pretty intense highlighted look but they still look so natural. The mesh and blend seamlessly with all over base products to. Ipanema Sunset (bronzer) - this is the perfect warmed toned Bronze colour. It's not Orange at all. It does have a slight shimmer to it, but this just makes the face look healthy. The formula is so nice. It blends easily and doesn't apply patchy or washy like. I like to use a large fluffy brush and apply this to the areas of the face the sun would naturally hit. Apricot Blossom (mineral Blush) - in the pan this doesn't look like a blush shade I normally go for. But it's actually so nice. It's a pale Pink colour with a satin finish. Paired with the bronzer this gives the skin that kind of Pink look that you would naturally get after being in the sun. I really rate the formula of Becca blushes. They're not to pigmented that you end up going over board but not so sheer that you have to build it up. It applies and blends easily to. Opal (highlighter) - Opal is Beccas cult classic highlighter! This is a stunning Champagne colour, that catches the light perfectly. It is so buttery soft. it doesn't contain any glitter. It's just perfect. This is like blush bronzer hybrid. The shade is in between a warm toned Bronze and Red toned blush. I love it. Milani's Baked Blush formula is one of my favourites to. They apply, blend and last so well. It pairs well with bronzer or can be used alone. For the most intense golden highlight this is incredible. It looks amazing with a tan. This is one of my favourite highlighters but it's not for the faint hearted, this is a very intense highlighter that gives the skin an almost wet look to it. The formula is so creamy, smooth and free from glitter or chunkiness. This doesn't exaggerate any problem areas nor does it fade throughout the day. If you want a really intense highlight I really can't recommend this enough. There's a few of my favourites for achieving a sun kissed glow.